This is a great list, with one minor correction, the Aston Martin is the DB5, not a DBS. Oh yeah, I don't really think the Walther PPK is a"gadget". THUNDERBALL was most definitely part of the official, Cubby Broccoli Bond franchise. You're probably thinking of NEVER SAY NEVER AGAIN, the weird one-off non-Broccoli Bond movie starring Connery and based on the THUNDERBALL story. You TOTALLY forgot the jetski from Spy Who Loved Me! Maybe I'm too old, but most of America had never seen one of these contraptions in 1977. While everything else in the movie was fluff and fiction. But when people learned that the jet-ski was an ACTUAL WORKING PRODUCT, sales of the item boomed. Kawasaki had only JUST started mass producing the jet-ski in 1976. The movie almost single handedly launched the entire personal water craft industry! Although "Little Nellie" will always be high on my list, it's the little gadgets I enjoyed the most, from the micro-breathing apparatus in Thunderball to the pen bomb in Goldeneye; talk about hard to keep track of whether the thing was armed or not with Boris clicking away compulsively! Ahem, I mean DB5 not DBS. Where is the delete button on this thing. Your picture of a PPK is NOT a PPK. It is a Beretta. The PPK is a much nicer weapon. Yes, that is a PPK in the picture, just with a silencer. The PPK is a small, stubby ugly little gun, where as the Baretta you mention is closer in form to the Colt 1911 .45. Ya Eh !!! It is a DB5 Aston Martin. Unfortunatly the real car was stolen from its owner in Boca Raton, FL.. Unknown if it was ever recovered. But we have never seen Mr. Bonds personal gadget ? 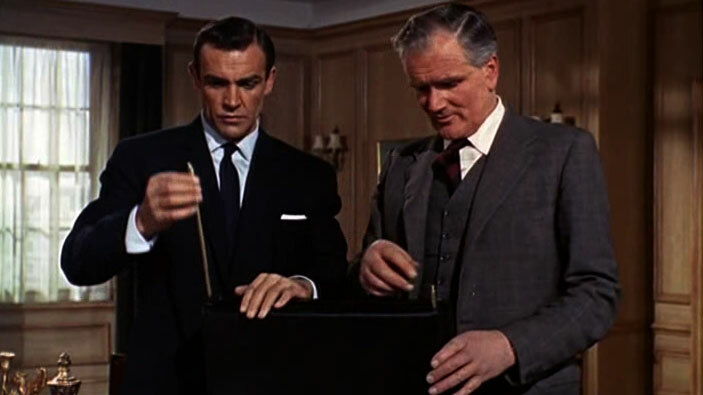 The magnetic wristwatch in Live and Let Die deflects a bullet… at long range and also unzips Italian operative’s dresses and one of only 3 movies that Q is not in, the others are Dr. No and Casino Royal. I am surprised it was not mentioned that "Little Nellie" made the front page of Popular Science as a very cool gadget back in it's day. There was an interview with the designer, more photos, and also an admission that the "quick assembly" sequence seen in the film was not characteristic of the real flying machine.